The craft-cocktail movement has taken over bars in the last few years—mixologists are concocting libations with as much precision as a five star chef. Farm-to-table ingredients have become even more important, and last year, the James Beard Foundation added an “Outstanding Bar Program” category to its annual awards, more proof that artisanal cocktails are thriving. Best ingredients matter, and when it comes to vermouth, we have the best. According to regulation, vermouth is an aromatized wine and is defined as a drink obtained from one or more wines with the addition of alcohol, aromatized using natural substances and/or preparations with the addition of aromatic herbs and/or spices and/or flavoring foodstuffs. The story starts in Turin in 1786 when Antonio Benedetto Carpano (Carp! –ano), following a period in which he studied to be a herbalist, invented the formula which was to give rise to the category of Vermouth products, by combining herbs and spices with muscatel. ...is the Italian vermouth par excellence, actually the first vermouth ever, made from white wine, Piedmont's muscatel and the rich wines from southern Italy. Its taste and aroma come from carefully selected brewed mountain herbs. Its vanilla bouquet is matched by notes of spices and dried fruit such as star anise, orange peel and dates. Although Carpano Antica Formula is its most refined and popular item, Carpano produces an array of styles that are delicious in their own right and fit beautifully on to anyone’s back bar. The story goes that in 1870 a stockbroker, caught up in a discussion with colleagues whilst in the Carpano wine shop about the increase in share prices on that day – one and a half points – ordered his usual Carpano vermouth but asked for the barman to add half a measure of bitter, using the regional expression “Punt e Mes”. The drink immediately became popular as an aperitif before lunch. Punt e Mes has a golden orange color, herby aromas, dark red with vermilion shades. The initial taste is one of sweetness, characterized by an intriguing accent of orange. This is followed by the characteristically bitter taste of the quina and ends on a sweet note. …is the name of the new Carpano vermouth. It has a drier taste and a lower sugar content than the other vermouths. 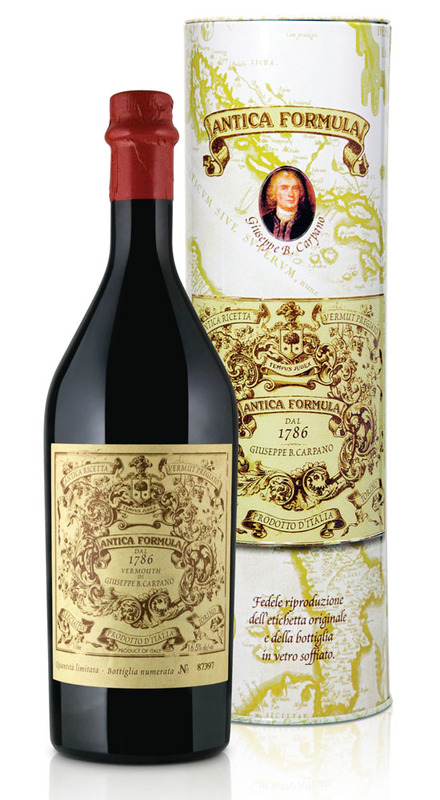 The product has its origins in the history of Carpano, enriched with the choice and use of top raw materials. Valuable Italian wines are chosen to make this vermouth, helping the finished product to maintain its sensory properties for a very long time. Carpano Dry is a clear vermouth, characterized by a balanced and well-structured richness of scents: candied fruit, spices, coriander, incense, lemon essential oil. The taste is slightly acidic followed by an interesting fresh, balsmic note which lingers as an aftertaste: citrus fruits and green apple.